After draining reserve funds generated by city asset sales, Mayor Daley has hitched Chicago&apos;s financial future to continuing the Great Chicago sell-off. If that&apos;s his rabbit in the hat, there are several viable alternatives, provided aldermen vilified for the parking meter fiasco are willing to go along with it. » Click to enlarge image Mayor Daley has hitched Chicago&apos;s financial future to selling off of city assets. The Chicago Skyway and, most recently, the parking meters have been privatized. What asset do you think Chicago could sell next? Don&apos;t sell off any more city assets! RELATED STORIESVote: What could Chicago sell next? Daley could privatize the water system or just the sewer portion. He could revive the $2.5 billion Midway Airport deal that collapsed for lack of financing and lay the groundwork to do the same at O&apos;Hare. If he wants to reduce operating expenses without generating up-front cash, he could privatize garbage collection or recycling. Water billing and other revenue collections are also possibilities. MIDWAY AIRPORT: This is the most immediate prospect, considering the groundwork already done. Former Daley chief of staff John Schmidt, who advised the city on the Midway and Skyway deals, says "alternative refinancing structures" under study could set the stage for the city to revive the Midway deal within six months without another round of bidding. "There is no law that says we have to go back through another auction process. There are other bidders who&apos;ve been found qualified by the airlines," Schmidt said. "If you look at corporate merger deals, there are a lot of different ways to create a market test to make sure you&apos;re getting the best possible deal without" another round of bidding. O&apos;HARE: If Daley is willing to think big and keep his powder dry, this could attract a monster payout. But roadblocks remain. Hundreds of millions worth of outstanding bonds must be paid off. The massive runway expansion project must be completed. And the Federal Aviation Administration, which agreed to make Midway the first major commercial airport privatization in the United States, would have to approve the transaction. "It would be enormously complicated. It couldn&apos;t be done for 10 years," Schmidt said. WATER SYSTEM: This sounds intriguing, but it&apos;s fraught with political danger. It&apos;s one thing to privatize the Skyway and street parking, which play to more limited audiences. But everybody uses Lake Michigan water purified and pumped through Department of Water Management facilities. Does Daley really want to put that service in the hands of a private company that might cut corners to improve its bottom line? One City Hall observer called it "a gamble I wouldn&apos;t take." Another complication is the condition of the city&apos;s water mains. Like the Midway deal, a private contractor likely would be required to offer jobs to city workers. Would they pay top dollar, only to inherit employees implicated in the Hired Truck and city hiring scandals? SEWER SYSTEM: This would probably make more sense from a political standpoint. "To put it crudely, people are less sensitive to the quality of what&apos;s going out than they are about the quality of what&apos;s coming in," Schmidt said. Chicagoans pay a sewer surcharge that amounts to 86 percent of a customer&apos;s water bill. If sewer service alone is privatized, those fees tacked on to water bills would have to be separated. GARBAGE COLLECTION: Daley can&apos;t get up-front money without imposing a fee for garbage collection. But he could save money by farming it out, if he could withstand the avalanche of aldermanic opposition. It likely would make the controversy from the failed attempt to privatize side-street snow removal pale by comparison. No matter what assets Daley wants to unload, nothing will happen quickly. Aldermen were crucified for giving quickie approval to the parking meter deal. They&apos;re not about to do it again, said City Council Transportation Committee Chairman Tom Allen (38th). "The process going forward to sell more assets will be very different than it was for the Skyway and meters. It&apos;ll be much more public with the citizens weighing in on it," he said. Kent city officials want residents to help watch for and report mobile fleet-washing companies and others that are reportedly stealing water from municipal fire hydrants. The city has been losing money, thanks to the theft of water by several fleet-washing companies and other contractors. 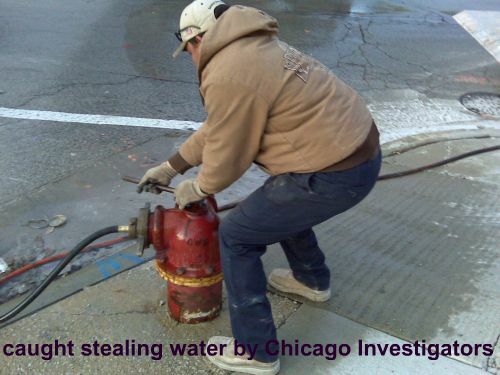 The thieves also are damaging hydrants and creating the potential for contaminating city water supplies. "We are seeing an increase (in 2008) compared to what has happened the past 10 years," said Brad Lake, city water superintendent, in a Dec. 23 phone interview. "We want more emphasis on catching folks for a warning or a fine from the police department." If residents see a truck using a hydrant without a water meter, they should jot down the vehicle&apos;s license-plate number as well as the name of the company, and call the Kent Public Works Department at 253-856-5600. "If we get a license plate number, we can follow it up," Lake said. Here&apos;s how to spot an illegal water hookup: The hose is attached directly to the hydrant without a water meter attached. Even city vehicles use water meters to monitor the amount of water they&apos;re using. Companies can fill up trucks in as quick as 10 minutes, depending on the size of the truck&apos;s water tank. The city can fine companies up to $300 per day for using hydrants without a permit or meter. Police also can cite the companies for theft of water or malicious mischief for damage to the hydrants. City policy requires companies to get a permit, water meter and a specific wrench from the public works department to legally use fire hydrants. The city&apos;s permit fees are $50 for 1-inch water meters and $100 for 3-inch meters. Permits are valid for up to 60 days. Contractors that provide mobile fleet-washing services use the hydrants to fill up trucks with water before heading to a job site. But a few companies hook hoses directly to the hydrant and use pipe wrenches to open the valve rather than using the city-issued water meter and wrench. "They can break the (valve) stem and that makes it non-operating when the fire department shows up," Lake said. "And the hoses (without a proper connection) can contaminate the water." Lake said the water meter helps to control backflow that can contaminate the water supply. City workers constantly repair hydrants damaged by improper use. Gwen Abraham, who works in accounting services for the Kent Public Works Department, bills the companies that get permits and check out water meters. She discovered even a few of the companies that check out water meters don&apos;t always use them when hooking up to the hydrants. "A company with a 500-gallon truck, the cost would be at least $20 per fill," Abraham said. "They have the meter for 60 days and the meter charge is $11 total. There&apos;s no way. Even if they only had one fill per day, the cost for 60 days would be $1,200." City officials said they are unable to estimate how much revenue the city has lost because it&apos;s difficult to know how many companies illegally fill trucks and how much water those companies take. "We really don&apos;t know," Lake said. "But we try to talk to companies to educate them. We&apos;ve had meetings with a couple of companies. We&apos;ve issued a couple of citations, but that&apos;s not what we prefer to do." City employees recently caught one company stealing water from a hydrant and gave the company a warning, Lake said. The next day city employees caught the same company hooked up again to a hydrant without a meter. Police cited the firm for theft. Besides fleet-washing companies, contractors at construction sites use the hydrants for pressure washing. The city also has issued permits for filling up swimming pools. The city started a permit system for companies to use fire hydrants more than a decade ago, because of the thefts from the hydrants. "Kent felt it was better to have a program to use the hydrants properly, meter it and protect the system from damage," Lake said. "And we can use legal enforcement to go after folks who take water illegally." Lake has met with the Kent Police to help inform officers to keep an eye out for illegal use of the hydrants. Kent Reporter Courts, government reporter Steve Hunter can be reached at shunter@kentreporter.com or 253-872-6600, ext. 5052. A Chicago city employee was awarded more $1 million by a jury Friday in a wrongful arrest and conspiracy case stemming from a 2006 arrest in which she refused to rescind a parking ticket issued on a police officer’s car. On Friday a jury found in favor of Jacqueline Fegan and awarded her $1.553 million in damages, according to a release from the law office of Tobin, Petkus & Munoz. With court costs and legal fees, the decision could end up being more than $2 million. Fegan filed suit against Robert Reid, James Young, Michael Drew, Dennis Doherty and the city of Chicago. She was a supervisor for the Traffic Management Authority under the city of Chicago’s Office of Emergency Management and Communications on May 18, 2006, when she was arrested after she refused to rescind a parking ticket issued by one of her subordinates on Officer Reid’s private car, the release said. She was injured during the arrest and was held at the police station. Although no charges were filed against Fegan, the complaint against the police officers and the city sought damages under a federal law in violation of her rights under the Fourteenth and Fourth Amendment to the Constitution, which includes a federal and civil conspiracy charge. The action also sought damages for false arrest, false imprisonment, battery, civil conspiracy and intentional infliction of emotional distress. pat do you think this will happen,the water dept being sold? this is very scary. i think this would open up employment to some not so safe people working with a very valued asset that this city has. what is this $uckhead daley thinking about. he has taked this city to a all time low with his miss useage of funds and tax payers money. please everyone that works for the city or lives in the city as a non city employee we must rid this place of daley and all the alderman that just keep filling there pockets with money from contractors,outside companys bidding on work that should be done by the city work force that is very willing and able to take on this task. we must save are jobs and this city. Has anybody contacted local 130 about employment with Illinois American if the lease deal goes through?? will water employees have first shot or are 130 “Chap stick club” members gonna get the jobs? and I bet that any 130 members employed will have to be full due paying members also. I also wonder who will be the license holder for that company (Response) The deal will be cut and Local 130 will sell out the members like they have in the past. Do not pay dues to local 130!!! Pat, looks a lot like you stealing that water. I was told by a top insider that Daley is selling the water dept. just to be able to fire you. Thanks a lot! I thought you were my friend, but now your causing my water rates to triple. If Daley sells out our water then I have a prediction. As the meter rates increase and skyrocket along with our water rates tripling, people will desert city businesses in droves causing tons of vacant stores and the ghetto area of Cicero Illinois near Roosevelt road will become the new hot area to buy new houses as they do not have to pay all of those city taxes and high water rates. You can buy up the lots in Grant Works Cicero near Roosevelt for pennies. atlanta sold their water system but had to take it back over. illinois american will not hire any city people everything will be subcontracted out. (Response) Many of the people with the public trust have gambling problems. They expect us to pay for their problems.